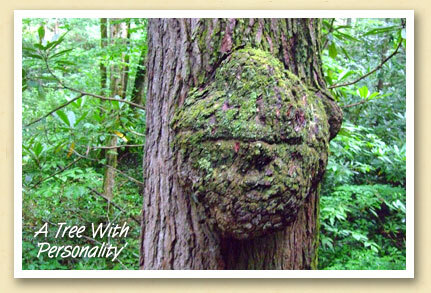 Postcards From The Smokies » Why Is That Tree Smiling At Me? Why Is That Tree Smiling At Me? Burls are rounded outgrowths on a tree trunk or branch that are filled with small knots from dormant buds. They’re usually the result of some sort of stress but are generally not harmful to the tree. James Clark, owner of the Deep Creek Boarding Stables, photographed this ‘smiling’ burl while riding his horse “Blackjack” in the Great Smoky Mountains National Park last summer. He was riding the Lakeshore trail along the north shore of Fontana Lake, and says this one is about the size of a soccer ball.